(Nanowerk News) A team of Australian engineers has proven -- with the highest score ever obtained -- that a quantum version of computer code can be written, and manipulated, using two quantum bits in a silicon microchip. The advance removes lingering doubts that such operations can be made reliably enough to allow powerful quantum computers to become a reality. The result, obtained by a team at Australia's University of New South Wales (UNSW) in Sydney, appears today in the international journal, Nature Nanotechnology ("Bell's inequality violation with spins in silicon"). 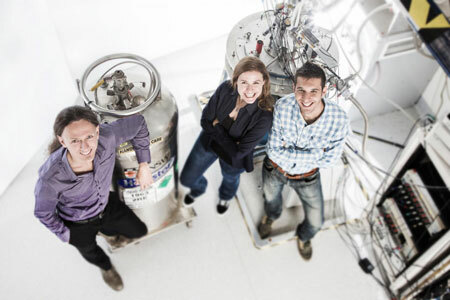 Project leader Andrea Morello (left) with lead authors Stephanie Simmons (middle) and Juan Pablo Dehollain (right) in the UNSW laboratory where the experiments were performed.